I just heard that Hallow Graves Haunted Manor is under re-construction on Seaside Height's Funtown Pier. This is the type of walkthrough haunted house I remember as a kid. You are greeted by a guide at the door. My guide was dressed like leatherface from Texas Chainsaw Massacre (without the mask), just a butcher's smock and "bloody" jeans. The guide leads you into each room then sneaks out behind you and meets you in the next room. He scared the hell out of me even though he wasn't trying. The animatronics inside are excellent and not behind cages. I had goosebumps during the whole 4-5 minutes it took me to walk through. The story behind the house is that you have been invited to dinner, but you are the dinner. Pretty good stuff!!!!!! Last edited by larrygator on Sat Mar 17, 2012 9:30 pm. You are correct. 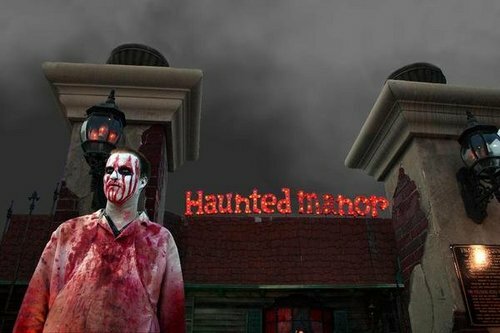 Hollowgraves Haunted Manor is returning to Funtown Pier in Seaside Heights. It's definitely the one you were in back in 2004. We spent four years there, 2003-06, and then returned to Northern NJ as a Halloween attraction in Vernon and Budd Lake. This will be our first summer back after a five year absence. As far as we're concerned, this is our final move and the Haunted Manor will remain a Seaside Heights haunt until its end. We expect to be open in time for May weekends and then, starting June 15 I believe, every day for the summer. For the time being, updates can be found on our Facebook page at https://www.facebook.com/HollowgravesHauntedManor and our Twitter page at https://twitter.com/#!/Hollowgraves. Our official website will be re-opening soon as well. Last edited by Hollowgraves on Thu Apr 05, 2012 9:17 am. ^Thanks for confirming. I was hoping that I wasn't spreading misinformation. Here's another article on Funtown Pier from a couple hours ago. According to the article, roughly 30 feet was lost, but other sections are "buckling from the force". Pretty blurry, but it looks like the entire end of Casino Pier is gone. Star Jet, Centrifuge, Stillwalk Manor and the Log Flume all appear to have been destroyed, and it wouldn't surprise me if other nearby rides have been lost as well. Very sad. And so to make sure, that is this god-awful ride, right? Thank goodness! Fewer people tortured thanks to Hurricane Sandy! SUCCESS!!!! Last edited by robbalvey on Tue Oct 30, 2012 7:04 am. ^^Yes, based on the video, not exactly a great loss when it comes to coasters. I feel sorry for the pwople who run the park, though. cfc wrote: ^^Yes, based on the video, not exactly a great loss when it comes to coasters. I feel sorry for the people who run the park, though. It's like me wanting to feel bad for those people in Los Angeles who bought their house on a hillside and then lose their property during a rainstorm mudslide. Or those who buy a house in the middle of a forest and lose it due to forest fires. 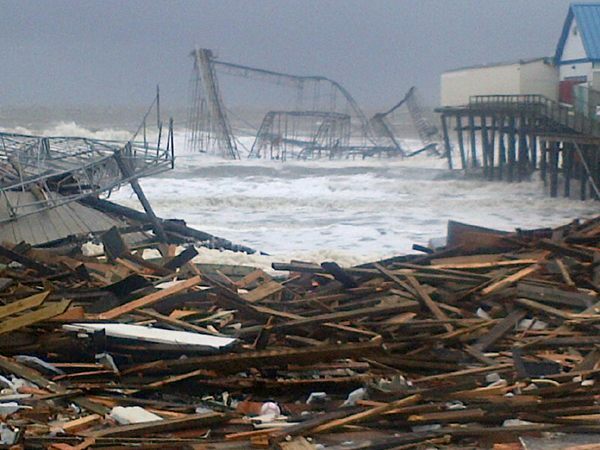 History has taught us that seaside piers have a a fair chance of collapse in an awful storm like this. I remember the Redondo Beach pier collapsed TWICE when growing up in SoCal, so it's not like something like this isn't un-expected. Not sorry for the coaster being lost. That thing was a pile of crap! ^Exactly. It's a real business, you have to assume they have insurance and can rebuild and make things even better! As well as put more people to work in the process. I just read an interesting article about how disasters like this actually help our economy.